heres another report from this guy. 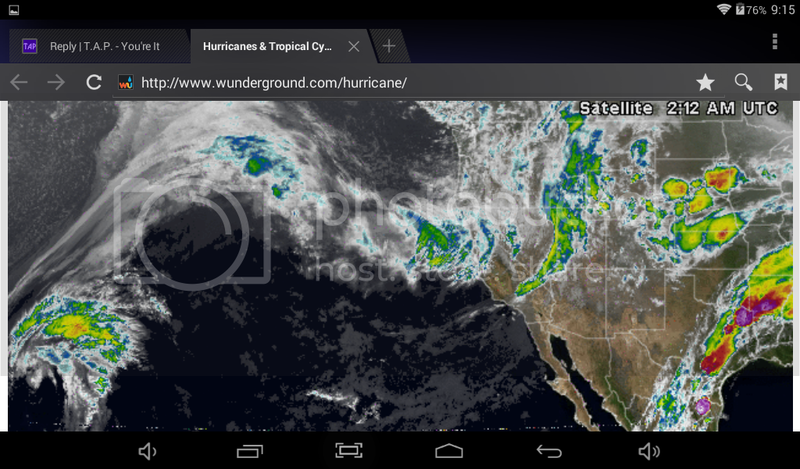 Well, if it all happens, I hope My family in San Diego is OK.
well,lets see if california gets its rain. 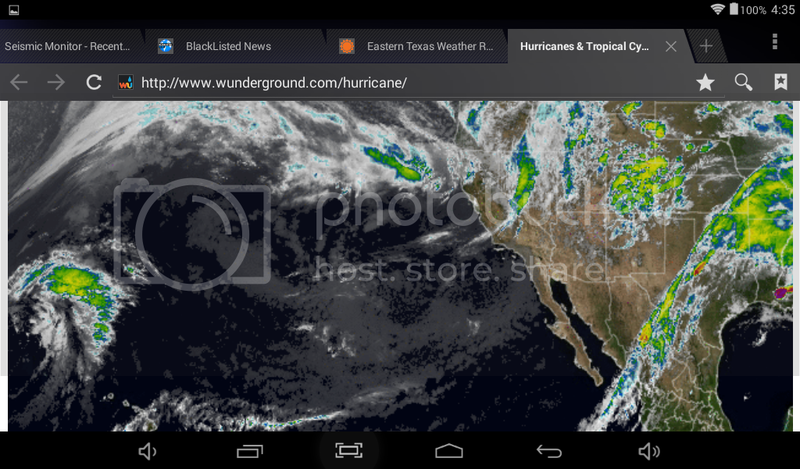 the northeast texas purple is what im dealing with currently. Yup. I figured, based on what I saw. i caught this circular anomoly traveling east by southeast towards mexico.its the remnants of the column that disappeared when high pressure dome left california. i wonder if it will be used to move the train of rain off of texas. lol,takes alot more than that to move me.three days of darkness would be a nice break from the humdrum of life.plus the ash will make good fertilizer. but anybody north of tulsa ok should evaluate their personal situation. if quakes travel at around 700mph then thats the number for future possible quakes as well. since its like 2100 miles from yellowstone to new madrid.if yellowstone sets off new madrid.it may happen three hours after yellowstone eruption or quake. hopefully all the rain the usa has had will dampen the effects of a quake. the ash will travel 600 miles per day.so most will get notice before hand about it. those living below tulsa should get around a centimeter of ash but thats alot of ash when its stirred up in the air.people with breathing problems could easily die. 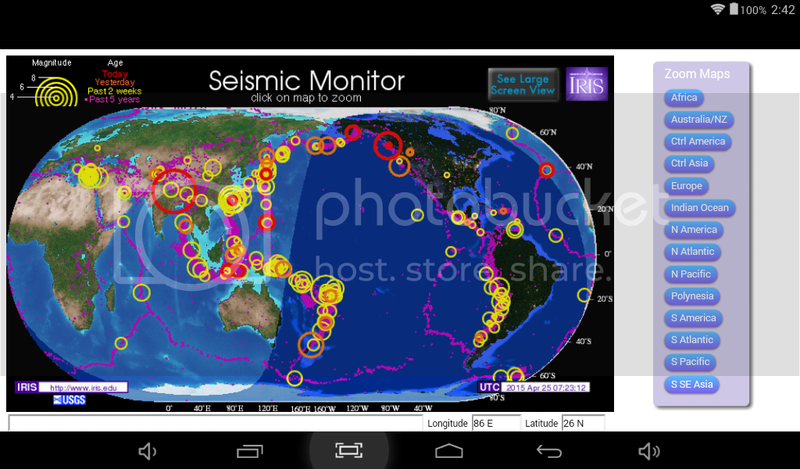 a big quake could circle the globe ,setting off other loaded plate sections,cascading for days. i find it strange that this happened right after california got rain.the high pressure dome off the california coast had moved out the day before.at least i got a screenshot of the strange collumn cloud before it dissappeared. Lots of "coincidences" involved with this... Seems only days before Some were talking about expecting about an 8.0 somewhere, and Others were discussing preparedness for a large EQ. No, seismic waves travel much faster than that, the slower ones travel at something like 4000mph, so the 2100 miles between Yellowston and the New Madrid fault would take around 30 minutes to be reached by the slowest waves. The fastest waves travel 4 times as fast, so they could take only some 8 minutes to cross that distance. The speeds above are for the crust, seismic waves travel almost twice as fast in the mantle. Not likely, rain remains only the most superficial layers of the crust. Depending on the type of eruption it may create a pyroclastic cloud that can travel at something like 400mph with a temperature of around 1000º C.
Don't forget that the ash is not really ash, it's more like extremely fine rock dust than ash, so even people without breathing problems can easily get them because of that. Not likely, the energy of an earthquake, like the light from a lamp, gets weaker with the distance, so only a relatively small area is affected. 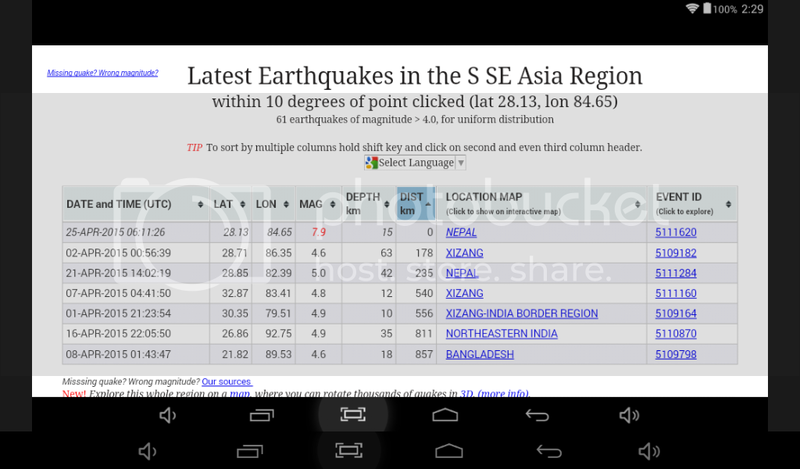 In the Japan earthquake (M9, if I'm not mistaken), for example, how many earthquakes were triggered? 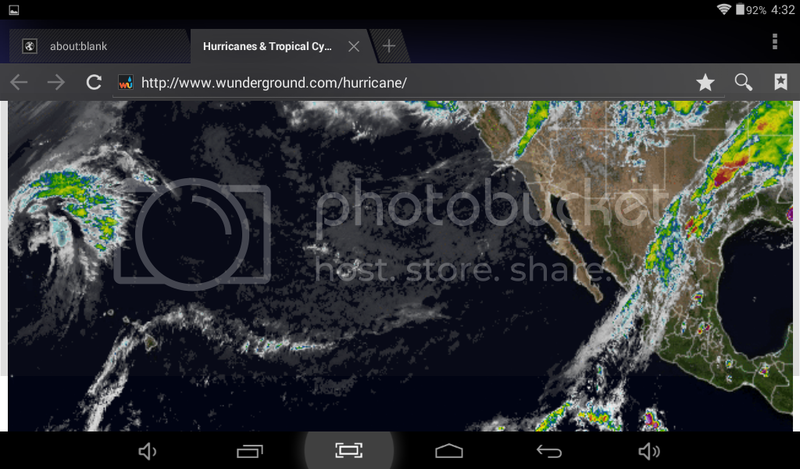 after all the rain,i think jade helm is the radar screen as its jade for light rain.ive gotten almost a foot of rain in one month on top of two feet of rain and snow the two months prior.this is the most rain ive ever seen.its got to be geo engineering. Put that in quotes... "Geoengineering." It's soft kill, really. Yes, weather modification is creating havoc for many. this is all just one big test and we are the lab rats.for yall that dont know,watch the national radar screen.the anomolies are all over it. or as the band tool would say,learn to swim. hi guys,just checkin in.more earthquakes in Oklahoma and cali. I think the fracking is just an excuse to pump concrete down into the tunnels being bored.to line the tunnels.otherwise natural gas should be the cheapest fuel on earth as dallas has been dotted with holes all over in the last twenty years.and east texas already had thousands of wells.so far no more info on Livingston walmart closing or the other stores.they came in my local walmart and cut four giant squares in the middle of the store and retiled them.that doesn't make since.its a low traffic area anyway.where the shoes and jewelry stuff was. I wont be getting my new tablet screen for a month .so im not getting internet service until next month.why pay for something im not using.i hope all is well with yall.big hugs to all. Yes, the rock headgear has gone too quiet, don't You think? Interesting about closings and weird modifications to wallies. Something is up. Calm --> Storm? We shall see. im still leaning towards yellowstone eruption between april and june.to give time for evacs before they set it off for the big one. my brain says apophis but nasa has lots of reports saying no.lol. im doing research down this line.c yall in about four days. Volcano in japan going off,volcano next to mexico city going off,8.3 earthquake in chile. I think the usa fires out west are to get rid of the fuel now.kinda like fire breaks and a pre burn. Could these be D.U.M.B.S ?